The outlines of a Trump presidency are starting to appear. His appointment of Senator Jeff Sessions (R., SC) as attorney general is key. He has been one of the hardest core senators against immigrants. As attorney general he will be in a position to really move against immigrants, especially those without papers and most particularly those who have had any sort of contact with the law. In this context, the “Dream Act” should be seen as a real threat, since youth who were brought to this country without documents who registered under the “Dream Act” are now more exposed. 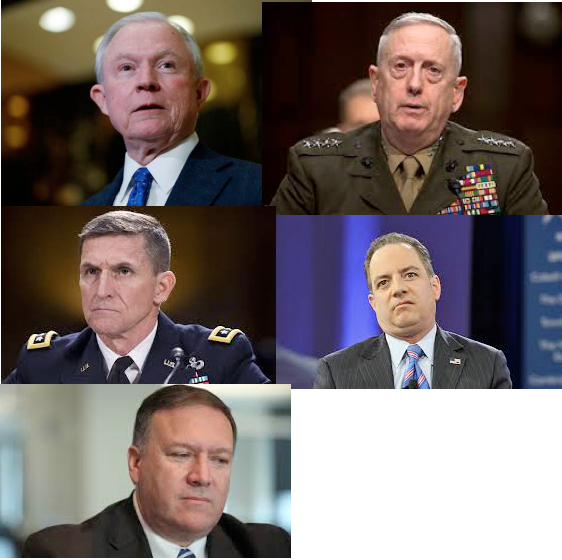 Trump appointees and possible appointees to date. This team is known to strongly oppose the Iranian nuclear deal, as is Trump. What Trump personally believes in is almost irrelevant. More important is the fact that he campaigned against it and bases himself on the right-wing populist pro-war rhetoric as well those sectors of the military-industrial complex that favor a more aggressive approach. Given that the Putin regime is closely allied with the Iranian one, this means that all Trump’s pro-Putin rhetoric will fall by the wayside, especially if there is a US attack on Iran. An attack on Iran, or even increased tensions, would also open the door to increased repression on Muslims in this country. This could be coupled with a general attack on immigrants, especially those without papers. Trump’s base of support is quite narrow. With the uncounted ballots, he will have ended up getting about as many votes as did Romney in 2012. Given this, and given that major sectors of his class – the capitalist class – are very skeptical of him to say the least, he may move cautiously on these fronts at first. Possibly his first major step would be to open up federal lands for oil, mineral and ranching exploitation. This would actually get major support from the building trades and Teamsters union leadership, and the AFL-CIO at best would probably be neutral. In fact, large sectors of the working class itself would very possibly support this and he could broaden his base both within his own class as well as within the working class. But ultimately, he will have to move against both Iran and against immigrants in this country. It’s impossible to know which will come first, or if they will happen together. A war with/invasion of Iran would be devastating for workers around the world. A “terrorist attack” that is blamed on the Iranian regime is possible, although the difficulty would be that almost all the Muslim terrorist groups are Sunni Muslim and the Iranian regime is Shiite. What sort of opposition can be expected from the less crazed sectors of the US capitalist class and their representatives in the Republican and Democratic Parties? Basically, the capitalist class as a whole seems to be taking the view that they didn’t trust him, that they’d rather have had a Clinton victory, but “let’s see how things work out; maybe he can get away with what he’s planning and we can move a lot further than we had though.” Trump’s appointment of Priebus as chief of staff will serve to cement his ties with the Republican mainstays. Never one to step out on the front lines, the union leadership has mimicked the Democrats. Rich Trumka, president of the AFL-CIO, in an official statement, commented “The AFL-CIO accepts the outcome of this election and offers our congratulations to President-elect Trump.” Dennis Williams, president of the United Auto Workers, gave Trump limited support with his comment that Trump’s “position on trade is right on.” In other words, zero resistance can be expected from the leadership of the unions. This failure fits right in with their refusal to fight the boss in the work place. That is why it is vital that workers and youth start organizing now. A small example is the small community meeting called by this leaflet below. Activists can do the same in their neighborhoods throughout the country. One step coming from those meetings could be to try to make the public schools centers of resistance to any deportation raids. Another could be to start to bring workers and youth together on the molecular level, linking up different community and work place based groups like these. This could develop into a mass protest on January 20, inauguration day. Such a base could also develop into a true mass movement, one capable of effectively resisting any drive towards war with Iran or any other increased military intervention overseas. Such meeting could be organized throughout the country. Such neighborhood councils could also make a drive into the unions and help union members organize to transform the unions. Out of this, the basis for a genuine working class party could develop. 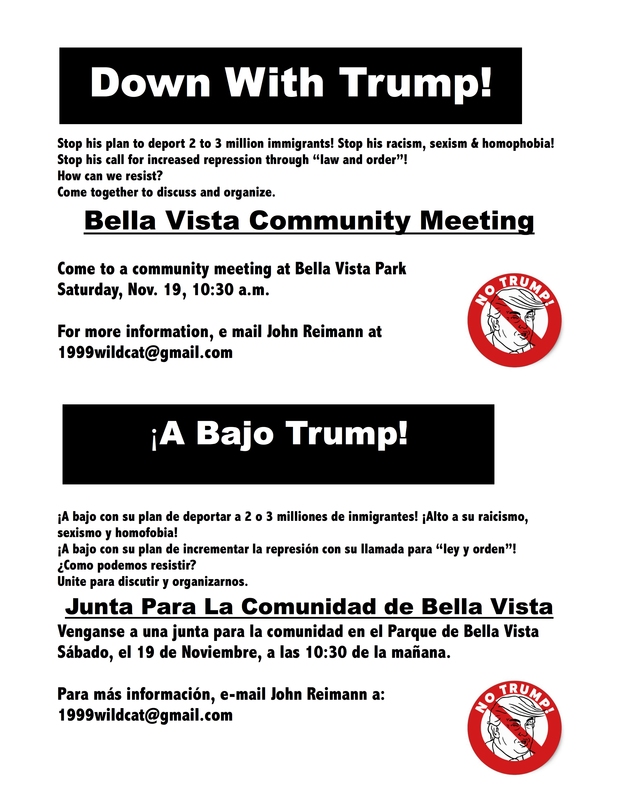 Such a party could coordinate a mass, working class resistance to all the attacks of a President Trump — attacks on immigrants, on people of color, on Muslims, on LBTQ people and on workers in general. It could also start to formulate the lessons of the recent decades and the program and strategy for the working class to unite and reverse course in the United States and in the world. This would include running candidates for public office, hopefully on a socialist program.